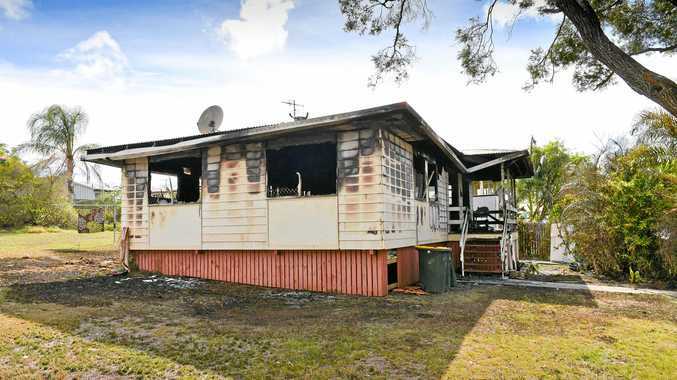 FIRE has destroyed an unoccupied housing commission home in Toolooa early yesterday morning. At 1.05am, three fire crews attended a single-storey residential property in the vicinity of Angler St, near Trevally St, and found the property well alight, with flames coming out of all sides. Two urban firefighter units from Gladstone and one from Boyne Island-Tannum Sands were called to help control the flames. Gladstone area acting inspector Noel King said the fire took approximately two hours to extinguish. "But the fire was under control within the first 30-45 minutes," Mr King said. He also said the flames were at risk of spreading to other neighbouring properties. "There was a problem on the eastern side of the building, where one of the houses next door sustained some minor damage," Mr King said. No-one was inside the property at the time of the fire, but one firefighter was taken to Gladstone Hospital as a precautionary measure due to possible exhaustion. "He was a pump operator of the (water) appliance, so a very physical job as you can imagine," Mr King said. Although the flames were under control, the single-storey house was completely destroyed, and could be demolished. It is believed no one was living in the housing commission property at the time of the fire, but had been in that state for weeks prior to the incident. Police immediately set up a crime scene to investigate the cause of the blaze. The fire appeared to have started at the front of the house, according to the Queensland Fire and Emergency Services, but police are still investigating. "We're conducting further inquiries this morning in relation to the cause of the fire," Detective Senior Sergeant Anthony Andersen said at a press conference. Toolooa House Fire QPS Press Conference: Detective Senior Sergeant Tony Andersen addresses the media over a house fire in Toolooa. Police have been visiting neighbouring properties for more information regarding the blaze, but police are not ruling out arson. "Destruction of property by fire/arson is very serious charge, and it can attract jail time, so it's a serious matter," Snr Sgt Anderson said. "We treat all fires as suspicious until proven otherwise." If anyone has information about the blaze, they are encouraged to come forward at the Gladstone Police Station, or phone Crime Stoppers on 1800 333 000.